TROY was Production Designed by Nigel Phelps, one of my oldest friends in the Art Department. I was asked to work on the film as Supervising Art Director to run the design, construction and dressing of the sets in MALTA and to schedule and budget the entire film that was made in 4 countries: England, Malta and Mexico for filming, and Morocco for the manufacturing of key props and chariots . The Maltese side of the film was largely self contained, with an extensive set construction crew, including a sizeable group from the UK, and large prop, weapon and set dressing departments. 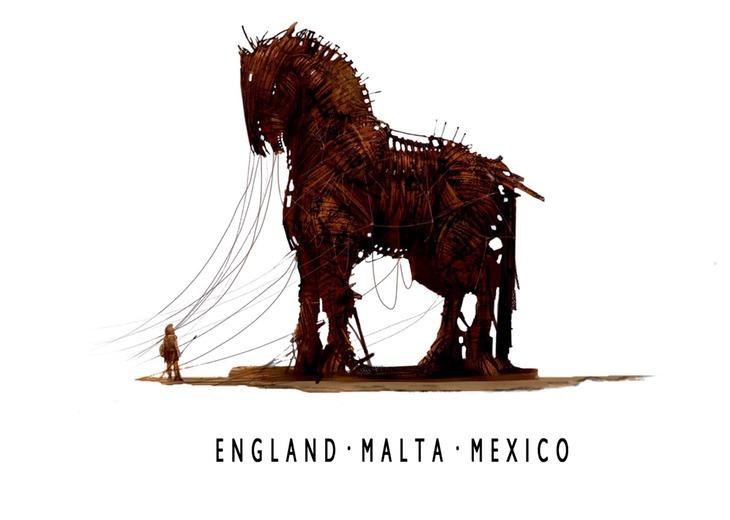 The Trojan Horse was sculpted in the UK, but sent out to Malta for construction and finishing. In the Maltese ship yards, we entirely constructed two “Triremes” (Ships) that needed to be certified as ocean going vessels due of the number of crew and extras that were required on board for rowing and shooting. At the end of the Maltese shooting period, many continuity props, weapons, costumes etc were air freighted to Mexico to continue with the scenes to the exterior of the city walls. This also involved the Trojan horse, which was carefully disassembled, packed and flown to Mexico . The images shown below are from the Maltese set and locations, and in addition a set in London that I drew at the beginning of the film. A huge number of people were involved in the creation of these sets and although the film was fully resourced by Warner Bros, it was still a challenging budget to work with, given the scope and size of production.